The original cast iron water main within the project area was installed in 1895. It has suffered repeated breaks over the years and has exceeded its useful life. SPRWS crews along with Quam Construction Co. will replace the existing 6” cast iron water main with 8” HDPE pipe via a trenchless method called pipe bursting. This work is being coordinated in advance of mill and overlay improvements planned to be completed by St. Paul Public Works in 2020. We anticipate this stretch of the work (between 7th Pl. and Exchange) to last until late May or early June. Impacts to traffic and parking begin Wednesday night on April 17. Traffic control will be set up on St. Peter from 7th Place to Exchange St.
Traffic on St. Peter will be reduced to a single lane. Westbound 7th St. will be reduced from two through lanes to one at the St. Peter intersection. Parking on both sides of the street will be prohibited, except for deliveries. The pedestrian crossing at 7th Place will be closed. Pedestrians may cross the street at 6th St. or 7th St. while the work is being done. SPRWS crews will be potholing and excavating on the west side of St. Peter to locate utilities beginning the week of April 15 to about April 29. 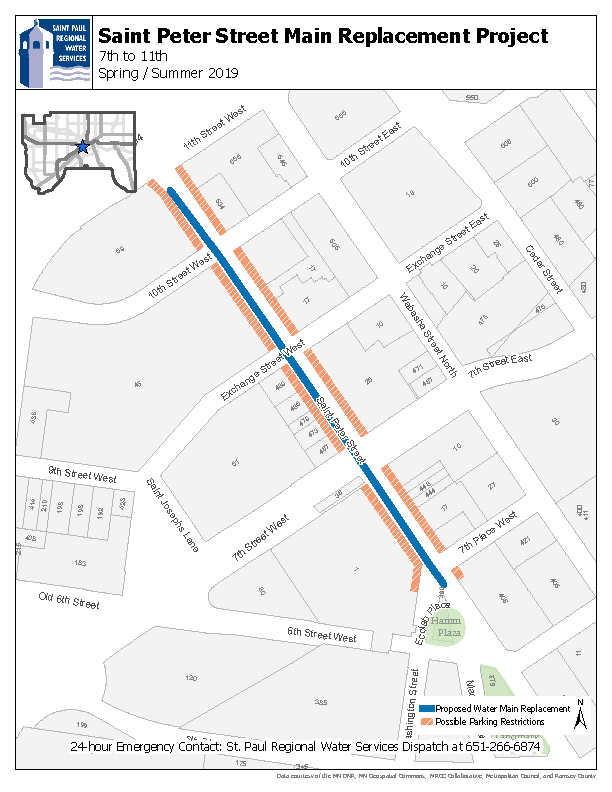 Temporary water lines will be constructed above ground along the sidewalks to provide water service to customers currently fed by the St. Peter St. water main. This work will continue into the week of April 22, with excavations being done in the sidewalk areas at various locations to tie into underground service lines.